Martin Boyle's double and a fabulous 40-yard strike from John McGinn brought Hibernian revenge against the only team to beat them in the league this season. 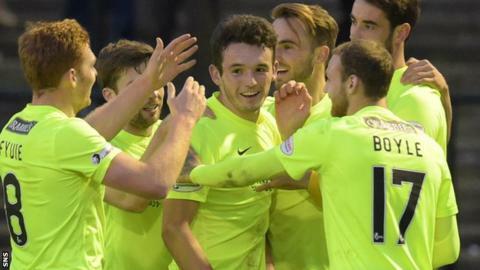 Victory over Ayr maintained their three-point lead over chasers Dundee United at the top of the Championship. Boyle sprang Ayr's offside trap before his shot was deflected past Greg Fleming for the opener, and a low shot with 13 minutes left doubled the lead. McGinn's strike brought the house down, zinging beyond a helpless Fleming. The win and its style backed up manager Neil Lennon's decision to keep top-scorer Jason Cummings on the bench again in an unchanged Hibs team. Even when Lennon changed things late in the second half, he preferred to replace Grant Holt with Brian Graham rather than Cummings, who was only given the last few minutes as a late substitute for McGinn. Ayr performed well in front of a 3,100 crowd swelled by a large away contingent, but in truth the Hibs goalie, Ofir Marciano, was seldom seriously troubled. On the one occasion he was, the Israeli produced a wonder save to deny Jamie Adams' header, throwing himself to his right to turn a net-bound effort round the post. Hibs might have had further goals in the second half but Andrew Shinnie hit the post and Holt should have scored after Daryll Meggat was short with a back-pass. But it is McGinn's goal that will live long in the memory. Match ends, Ayr United 0, Hibernian 3. Second Half ends, Ayr United 0, Hibernian 3. Attempt missed. Brian Graham (Hibernian) header from the centre of the box is close, but misses the top left corner. Attempt saved. Darren McGregor (Hibernian) header from the centre of the box is saved in the top left corner. Corner, Hibernian. Conceded by Nicky Devlin. Substitution, Hibernian. Jason Cummings replaces Andrew Shinnie. Substitution, Hibernian. Marvin Bartley replaces John McGinn. Andrew Shinnie (Hibernian) wins a free kick in the defensive half. Foul by Conrad Balatoni (Ayr United). Goal! Ayr United 0, Hibernian 3. John McGinn (Hibernian) left footed shot from more than 35 yards to the bottom right corner. Assisted by Fraser Fyvie following a set piece situation. Foul by Paul Cairney (Ayr United). Substitution, Ayr United. Andy O'Connell replaces Gary Harkins. Goal! Ayr United 0, Hibernian 2. Martin Boyle (Hibernian) right footed shot from the centre of the box to the centre of the goal. Assisted by John McGinn. Attempt saved. Darren McGregor (Hibernian) header from the centre of the box is saved in the top centre of the goal. Attempt blocked. Andrew Shinnie (Hibernian) left footed shot from the centre of the box is blocked. Kevin Nisbet (Ayr United) wins a free kick in the defensive half. Substitution, Ayr United. Kevin Nisbet replaces Jamie Adams. Andrew Shinnie (Hibernian) wins a free kick on the left wing. Andrew Shinnie (Hibernian) is shown the yellow card for a bad foul. Attempt missed. Grant Holt (Hibernian) right footed shot from the centre of the box is high and wide to the left.